The fourth year of X Games Norway competition will be unlike any other – combining Snowboard, Ski, Skateboard and Moto X events in a one-day action sports extravaganza on August 31 at the Telenor Arena in Oslo, Norway. 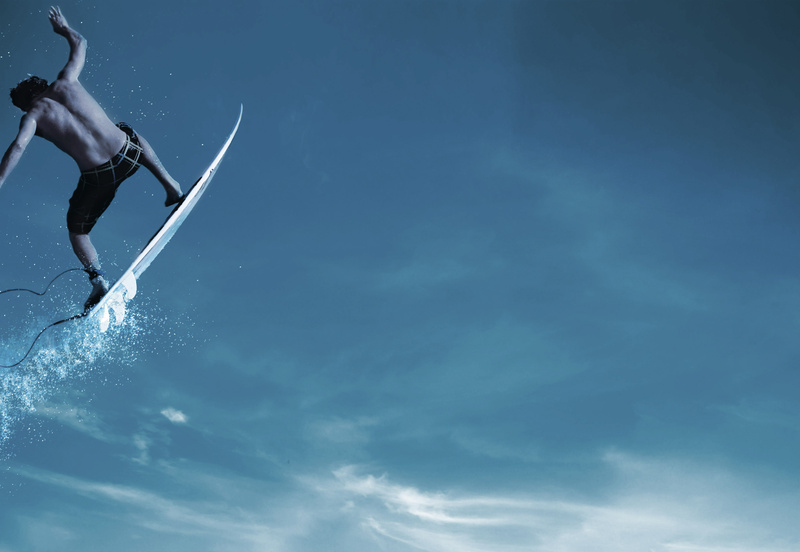 The X Games Norway program has previously included Ski, Snowboard and Skateboarding in the same event, however Moto X competitions will make their debut in 2019. 2018 was one for the books for ROXY. The year marked the launch of the leading female only activewear brand’s Make Waves Move Mountains campaign, dedicated to empowering women and supporting them in their individual challenges. A year later, the brand aims to help bring the women behind it to greater heights yet and takes the next step for the Make Waves Move Mountains tour. The 2019 World Surf League (WSL) Big Wave Awards (BWA) nominees are officially locked in. Top honors will be awarded across eight categories: Ride of the Year, Women’s XXL Biggest Wave, Men’s XXL Biggest Wave, Women’s Biggest Paddle, Men’s Biggest Paddle, Wipeout of the Year, Men’s Best Overall Performance of the Year, and Hydro Flask Women’s Best Overall Performance of the Year. Andrea Moller (BRA) is nominated for the Women's Biggest Paddle award for this wave, at Jaws, Maui, Hawaii, on January 16, 2019. 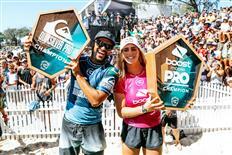 Today, Italo Ferreira (BRA) and Caroline Marks (USA) won the Quiksilver Pro and Boost Mobile Pro Gold Coast, the opening stop on the World Surf League (WSL) Championship Tour (CT). The Final Series took place at Duranbah Beach, the event’s backup site, in two-to-four foot (0.6 - 1.2 metre) waves to determine the first winners of the season. (From L to R) Kolohe Andino (USA), Italo Ferreira (BRA), Caroline Marks (USA) & Carissa Moore (HAW), at 2019 Quiksilver Pro and Boost Mobile Pro Gold Coast, at Duranbah Beach, Coolangatta, Queensland, Australia, April 8. ISA unites global surfing community across all five continents to demonstrate the positive impacts of Surfing. Surfers from newly added ISA Member Nation Oman celebrate the power of Surfing taking hold in their country. Italo Ferreira (BRA) won the Red Bull Airborne Gold Coast, a WSL specialty event that highlights aerial surfing. The 24-year-old is known for his creative antics in the air, landing some of the Championship Tour’s biggest maneuvers and setting the bar for above-the-lip surfing. Ferreira brought his same flair into today’s air show to light up Duranbah and take home the win. Winner Italo Ferreira (BRA), 2nd placed Reef Heazlewood (AUS), and third placed Yago Dora (BRA) seen during the prize giving ceremony of the 2019 Red Bull Airborne Gold Coast at Duranbah Beach, Coolangata, Queensland, Australia, on April 4. Josh Kerr (AUS) surfs in Torquay, VIC, Australia on March 24th 2016. In an exciting conclusion to the event in front of a packed audience, Gatien Delahaye (FRA) defeated Carlos Muñoz (CRI) at the inaugural Claro Open Pro – Copa Tubos. The 21-year old Frenchman caught the best waves on Finals Day at the lefthand pointbreak of Señoritas, Punta Hermosa and was visibly stoked as he was chaired up the beach by his fellow countrymen. Alex Ribeiro (BRA) and Marcos Correa (BRA) both earned equal 3rd place finishes after reaching the Semifinals. Event winner Gatien Delahaye (FRA) being chaired-up the beach at the 2019 Claro Open Pro – Copa Tubos, at Señoritas in Punta Hermosa, Peru, March 31. The world's best surfers were honored tonight at the World Surf League (WSL) Awards, the event that celebrates the achievements of the 2018 season. 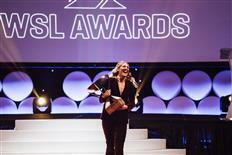 Two-time WSL Champion Gabriel Medina (BRA) and seven-time WSL Champion Stephanie Gilmore (AUS) honored at the WSL Awards for 2018 season, in Coolangatta, Queensland, Australia, March 2019. The 2019 World Surf League (WSL) men’s Qualifying Series (QS) Jack’s Surfboards Pro QS 1,500 crowned Crosby Colapinto (San Clemente, Calif.) its victor in pumping, five-to-six, occasional plus, foot swell on Huntington Beach Pier’s southside lineup for his maiden QS win. This marked Colapinto’s first Final at the QS level and waisted no opportunities during the best day of swell for the event, as well as any QS at the iconic southside lineup in recent memory, with excellent numbers in nearly all of his heats. The 17-year-old defeated an in-form Phillippe Chagas (BRA) during a tight Final bout. Crosby Colapinto's (USA) winning performance at the 2019 Jack's Surfboards Pro QS 1,500, Huntington Beach, California, USA, March 24. Jordy Lawler (AUS) and Alessa Quizon (HAW) have claimed victory at the 2019 Vissla Sydney Surf Pro and Sydney Women’s Pro presented by Sisstrevolution World Surf League (WSL) Qualifying Series (QS) 6000 event. Manly Beach provided another day of super clean 2-to-3 foot surf for some of the world’s best to put on a show for thousands of fans that lined the sand at one of competitive surfing’s most iconic beaches. Finalists at the 2019 Vissla Sydney Surf Pro QS6,000, (L - R): Jadson Andre (BRA), Isabella Nichols (AUS), Alessa Quizon (HAW) and Jordy Lawler (AUS), at Manly Beach, NSW, Australia, March 24. Tahiti’s own Taumata Puhetini claimed a massive, back-to-back win at the World Surf League (WSL) men’s Qualifying Series (QS) Papara Pro Open Tahiti QS 1,000 over an in-form Kauli Vaast (FRA), winner of the Pro Junior just three days ago, and completed his comeback to professional competition. The 31-year-old showed his experience and tenacity in the water, culminating with a perfect 10 in the Final over Vaast. This win gives Puhetini a fighting chance into the coveted Vans Triple Crown contention with one event remaining in the Hawaii / Tahiti Nui region. Taumata Puhetini (PYF) defends Papara Pro Open Tahiti Win at the 2019 event, at Papara, Tahiti, French Polynesia, March 15. The 2019 World Surf League (WSL) Championship Tour (CT) will host the biggest year in surfing yet with new format updates, equal prize money, and qualification for the Olympic Games Tokyo 2020. The season will launch on the Gold Coast of Australia at Stop No. 1, the Quiksilver Pro and Boost Mobile Pro Gold Coast, opening April 3, 2019. 7X World Champion Stephanie Gilmore (AUS), at 2018 Roxy Pro Gold Coast, Snapper Rocks, Gold Coast, Australia, March 2018. Gabriela Bryan (HAW) and Kauli Vaast (FRA) claimed important wins at the World Surf League (WSL) Papara Pro Junior Tahiti events, respectively. Bryan's dominance over Tahiti was undisputed after sweeping both the Papara Pro Open Tahiti Qualifying Series (QS) 1,000-level event yesterday and winning once more today in a rematch with Savanna Stone (HAW) for the Pro Junior victory. Following that showdown, the men's Final witnessed Tahiti's own Vaast deliver another spectacular day of surfing to secure his second-consecutive Papara Pro Junior win, this time over Robert Grilho (HAW) in dominant fashion. 2019 Women's Papara Pro Junior Tahiti winner Gabriela Bryan (HAW), Papara, Tahiti, French Polynesia, March 12. Gabriela Bryan (HAW) successfully defended her World Surf League (WSL) women’s Qualifying Series (QS) Papara Pro Open Tahiti QS 1,000 crown after a hardfought day of competition. Bryan, 16, couldn’t be stopped en route to the Final and took down standout, fellow upcoming talent Savanna Stone (HAW) in decisive fashion after powering through from Round 2 action to start her campaign. Two-to-four foot (.7 - 1.5 meter) foot swell greeted competitors to get the event underway and men’s Pro Junior action also completed Rounds 1 and 2, but the day belonged to Bryan. 2019 Papara Pro Open Tahiti QS 1,000 winner Gabriela Bryan (HAW) (L) and runner-up Savanna Stone (HAW) (R), at Papara, Tahiti, French Polynesia, Monday, March 11. 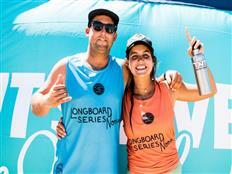 Justin Quintal (USA/Florida) and Chloe Calmon (BRA) have taken out the opening event of the 2019 WSL Longboard Tour, the Noosa Longboard Open. After 4 massive days of action surfed at 3 different locations around Noosa, Queensland, the pair took victory in clean 2-to-3 foot peaks at Castaways Beach. 2019 Noosa Longboard Open Finalists (L-R) men's winner Justin Quintal (USA), women's runner-up Honolua Blomfield (HAW), women's winner Chloe Calmon (BRA) and men's runner-up Steven Sawyer (ZAF), on the podium in Noosa, Queensland, Australia, Sunday March 10. The World Surf League (WSL) men’s Qualifying Series (QS) Air Tahiti Rangiroa Pro QS 1,000 crowned Gavin Gillette (HAW) its 2019 victor for his maiden QS victory. L-R: The runner-up Marco Mignot (FRA) and the winner Gavin Gillette (HAW) of the 2019 Air Tahiti Rangiroa Pro, Rangiroa, Tuamotus, French Polynesia, March 7th. Sage Erickson (USA) and Connor O’Leary (AUS) have won the first World Surf League (WSL) Qualifying Series (QS) 3000 event on Australian shores, The Sisstrevolution and Vissla Central Coat Pro. Avoca Beach turned on bumpy 3-to-4 foot right-handers for the Final Day with the biggest scores of the event going down in the last few heats. Erickson and O’Leary both fell off the elite Championship Tour (CT) at the end of 2018 and have put themselves in a great position for re-qualification with this victory. Vissla and Sisstrevolution Central Coast Pro WSL QS3,000 Champions: Sage Erickson (USA) and Connor O'Leary (AUS), at Avoca Beach, NSW, Australia, March 4, 2019. 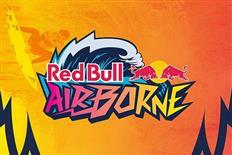 Today, the World Surf League (WSL) announced the Red Bull Airborne Series, a three-event specialty series that highlights aerial surfing. Six champions were crowned at the third and final event of the Billabong Grom Series presented by Oceanbridge event completed at Piha Beach, Auckland over the weekend. Caleb Cutmore (NZL) is the overall series champion in U18 boys division of the 2019 Billabong Grom Series presented by Oceanbridge, at Piha, Auckland, New Zealand, February, 23. Matt Banting (AUS) wins the 2019 Mothernest Great Lakes Pro, at Boomerang Beach, NSW, Australia, on February, 24. Jadson André (BRA) claimed the first World Surf League (WSL) Qualifying Series (QS) 6,000 of the year over fellow Brazilian Yago Dora (BRA) in an emotional Final that went down to the wire. Jadson André (BRA) is the winner of the 2019 Oi Hang Loose Pro Contest at Cacimba do Padre in Fernando de Noronha, Brazil, on February, 24. Ella Williams (NZL) has taken her first win in the World Surf League Qualifying Series, taking out the Women’s division at the 2019 Mothernest Great Lakes Pro, at Boomerang Beach, NSW, Australia, February 23. The 2019 Vissla Sydney Surf Pro World Surf League Qualifying Series 6000 event has been bolstered with 11-time WSL Champion Kelly Slater (USA) confirming that he will return to Manly to compete this March. The 11-time WSL World Champion Kelly Slater (USA) will commence his 2019 competitive season at Vissla Sydney Surf Pro, at Manly Beach, NSW, Australia, scheduled for March 18 - 24, 2019. Mount Maunganui surfer Luke Griffin hit his straps at Whangamata this weekend taking out his first event in five years at the Billabong Grom Series presented by Oceanbridge. Griffin was joined by Raglan based surfer Kai Woolf, who has recently returned to New Zealand from her native South Africa, as the winner of the Under 18 Girls Division. Luke Griffin takes the win at event #2 of 2019 Billabong Grom Series at Whangamata, New Zealand, February 10 2019. The 2019 Lake Macquarie City Pro Junior has been run and won with Aussie duo Molly Picklum and Caleb Tancred claiming victory over an impressive international field. Competition got underway this morning at Red Head Beach but was moved to Catherine Hill Bay after a strong southerly front moved through the region in the mid-morning. After the event moved locations, it was completed in clean, 4-foot surf. 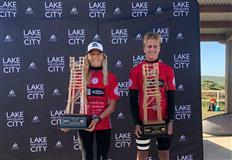 Molly Picklum and Caleb Tancred Claim Victory at Lake Mac City Pro Junior World Surf League Junior Qualifying Series, at Catherine Hill Bay, Lake Macquarie, New South Wales, Australia, on February 10 2019. Timothee Bisso (FRA) and Daniela Boldini (CNY) have won the QS1,500 Cabreiroá Las Americas Pro Tenerife held in two-to-three foot inconsistent surf at Las Americas. (From left to right) Leticia Canales Bilbao (EUK) (women's 2nd place), Daniela Boldini (CNY) (women's winner), Paul Cesar Distinguin (FRA) (men's 2nd place) and Timothee Bisso (FRA) (men's winner), 2019 Cabreiroa Las Americas Pro, Las Americas, Tenerife, Canary Islands, February 10, 2019. Jack Robinson (AUS), 2019 Volcom Pipe Pro QS 3,000 winner. Connor O’Leary (Cronulla, NSW) and Philippa Anderson (Merewether, NSW) have taken out the 2019 Carve Pro in a day of tricky one-foot waves at Maroubra Beach, New South Wales, Australia. Connor O’Leary (Cronulla, NSW) and Philippa Anderson (Merewether, NSW) have won the 2019 Carve Pro QS 1,000 at Maroubra Beach, Sydney, New South Wales, Australia, on January 26 2019. 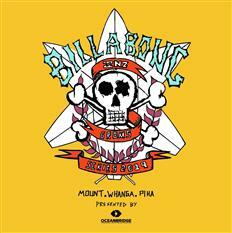 The Billabong Grom Series presented by Oceanbridge has been a cornerstone of summer surfing for New Zealand’s finest young surfers over an entire generation. This weekend (26 – 27 January), when the series kicks off at Mount Maunganui for the 2019 season, the fun, rivalries and enjoyment will be yet again etched into a new crop of young grommets.